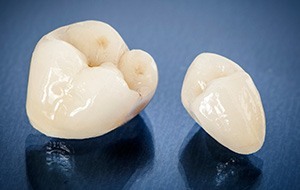 A common restorative procedure offered at Olberding Dental is the placement of crowns and bridges. Our Lincoln, NE dental practice has been providing the absolute best in crowns and bridges for years. With our experience, skills, and technology, we can ensure the perfect fit, supreme functionality, and seamless color matching. 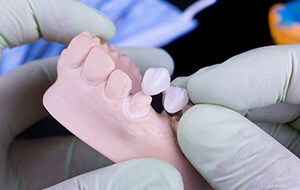 Bridges are dental appliances used to restore a missing tooth. When a tooth has experienced trauma so great that it can’t be saved, a bridge can connect the healthy teeth on either side of the missing tooth. The bridge is then anchored to the neighboring healthy teeth to support the beautiful, new prosthetic in the middle. The result is a magnificent restoration in appearance and functionality. Some dentists offer a crown made in their office while you wait, but experience has taught us that the best results come from skilled craftsmanship. We have a long-standing relationship with Bay View Lab, one of the most exclusive labs in the country. Bay View Lab is accredited by the world-renowned Dawson Academy, an honor extended only to labs meeting the highest standards of excellence. As a graduate of the Dawson Academy, Dr. Olberding has access to the services of this exclusive full-service lab that features published, world-renowned technicians. The technicians crafting your crown or bridge are in the top one percent of their field. Their credentials and talent, plus our expertise and workmanship, adds up to a smile you will be proud of. Your final result will be a restoration that looks and feels like it belongs. Call us today to schedule your next visit. Whether you’re looking for general, cosmetic, or restorative dentistry, you can count on us to provide service that exceeds your expectations. We will help you get to the root of your oral health problems so you can enjoy better comfort and functionality.